People often ask me what autobiographies written with a credited collaborator or ghostwriter that I admire. 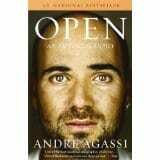 Since 2010 my answer has been Andre Agassi’s autobiograp hy OPEN. It is one of the most compelling and best written autobiographies of a celebrity ever. Period. The introduction shows you what tennis at the professional level is. The rest of the book transcends tennis and sports, and tells a coming of age story of a young man who hated the game that made him. As someone who co-writes autobiographies, I stand in awe of this project and the work that collaborator J.R. Moehringer did on this book. Many of the best writers cannot leave their turns of phrases aside and let the subject’s voice tell the story the way Moehringer does here. But for any autobiography to work, the material must be there. Agassi insisted his story be told in its entirety. He is as smart an athlete as there is, and he has done untold good building a diversified private school in his hometown of Las Vegas. (Full disclosure, I know him from my tennis days, which is why I can vouch for the evolution firsthand.) For a while to a lot of us who knew him, he was the guy who got the girl, Brooke Shields. (It’s all in the book.) But then he became himself and really got the girl, Steffi Graf, one of the classiest acts in sports. Back the book. If writing is a search for honesty, here is where you will find it, along with a coming of age story.